Pixe Social, the Maryland, USA based digital marketing solutions provider, announces a partnership with IMEX Group. IMEX, the international meetings and events organizers, will provide an interactive attendee engagement experience through the Pixe-powered photo booth this fall in Las Vegas, NV. After a successful presentation at IMEX Frankfurt, Pixe and IMEX are once again partnering to bring social engagement to its Hosted Buyer Program. The IMEX America Social Media Team will leverage Pixe Social, an award-winning photo booth solution that captures memorable attendee experiences and event testimonials. At IMEX Frankfurt, the Social Media Team snapped a total of 268 photos of excited attendees. 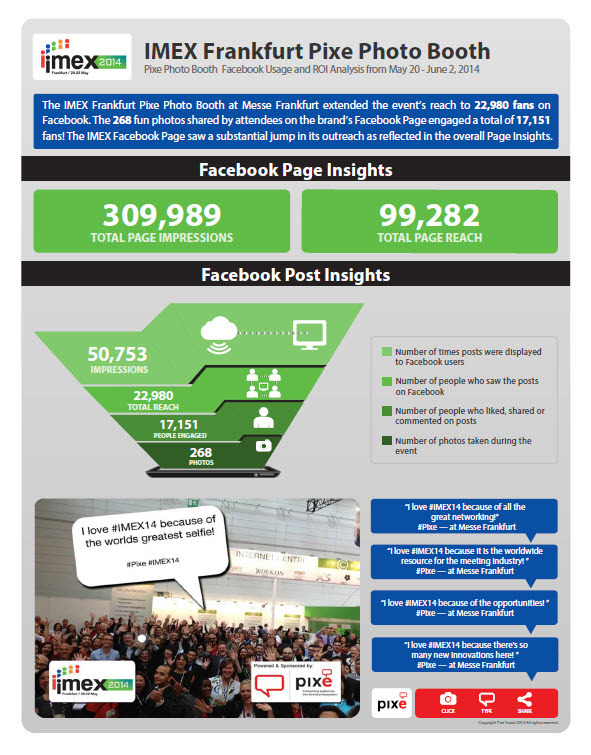 The photos uploaded directly from the show floor to create 50,753 Facebook Impressions and reached almost 30,000 social fans. With Pixe’s innovative ‘photomonial’ ability, show attendees expressed their interest and appreciation for the show’s variety of networking and business opportunities. IMEX America attracts thousands of international attendees each year to network with global brands, develop key buyer partnerships, and experience the innovative show landscape. Pixe will also showcase its solutions to buyers interested in growing their event’s social outreach in booth 761. Pixe’s innovative technologies provide events the unique opportunity to reach 4-5 times as many social fans as they would with traditional marketing. To learn more about Pixe Social’s digital marketing solutions or to schedule an appointment at IMEX America, please visit the Pixe Social exhibitor profile here. Pixe LLC is a Maryland-based start-up providing simple social promotional solutions that take the challenge out of social media marketing by converting audiences into brand ambassadors. Launched in April 2013, Pixe’s flagship social marketing solution - Pixe Social - helps boost the social presence of a number of leading brands and events.